Reefe King is a freelance agent. Attending college at Chicago U, the handsome and popular Jimmie Sainsbury had intended to make chemistry his vocation but as a hobby he joined a collegiate acting group. By his own admission his acting skills were limited but he possessed a boyish grin that the audiences loved. So did a talent agent named Manny who told him he could get him into movies. Sainsbury said why not and Reefe King was born! Being quite athletic and loving adventure, King was an action natural, able to handle guns and women, horses and fighting. He knew a fair amount of karate, had sky dived on numerous occasions, and was a lover of surfing. It was on television that his career really took off, becoming a star of the weekly action dramas. His style of self-effacing grins and barely-moving lips while talking made him a big hit. He even did most of his own stunts, to the anxiety of the network and the adoration of his fans. Visiting his Uncle Neil in Paris one summer during a hiatus, King was asked to help in a job by keeping an eye open for strange events while attending the upcoming Cannes Film Festival. This offer was made by his uncle who was a key man at Interpol. Thinking it could be a lot of fun, he agreed. Such was the way for a secret agent to begin. While the first assignemt that King performed was for Interpol, his second was on behalf of the CIA. At no time did he join any organization, keeping his well-paying day job and moonlighting as a dashing covert operative. Note: The author, Albert Barker, wrote these books for the paperback publisher Award but the series stopped at two adventures. Three years later, a similar series (very similar) was created by Barker for a different publisher, Curtis. For further comments on both series, see that entry. When a young actress, dubbed the 'cinema virgin' suddenly does a striptease on a beach and a major Western movie star shows up in public dressed in drag and comes on to a policeman, the scandal sheets go crazy and the police get confused. Interpol turns to King for help in breaking a drug ring with one end at Cannes and the other in East Germany. 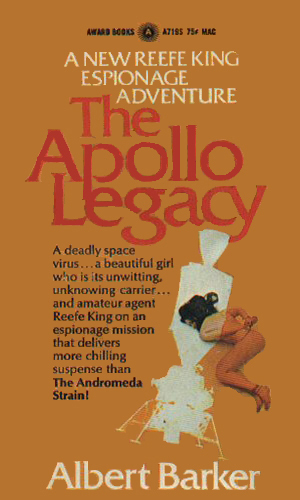 The illicit affair between a noted Apollo astronaut and a female journalist has two unexpected results. The first was a pregnancy which might be trouble due to a space virus. The second is a strong interest in the relationship by the Soviets desiring some way to embarrass the American space program. To find a way out of the scandal, the CIA asks Reefe King to help. Even though the Reefe King/Hawk Macrae series are so very similar, being the same character in essence, the King two-book adventure is certainly the training ground. 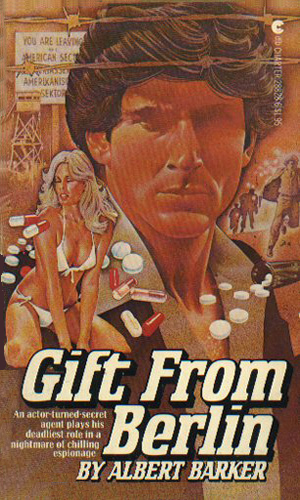 The books are not as smooth as the Macrae books and the plots are more wild and off-beat. Still, if names in all books were changed to something else and I was given the books in no apparent order, I probably couldn’t tell which had been King and which had been Macrae. Nevertheless, my first paragraph remains. I enjoyed the King/Macrae books for what they were – fast action adventures with no pretense for being anything but. The character is made for loving and brawling and saving the day, then going back to the loving. Nice job if you can find it. Except for the brawling part.